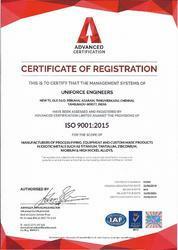 Leading manufacturer, supplier and exporter of Titanium, Tantalum Products For Industrial Applications.
" 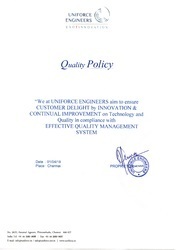 We at UNIFORCE ENGINEERS aim to ensure CUSTOMER DELIGHT by INNOVATION & CONTINUAL IMPROVEMENT on Technology and Quality in compliance with EFFECTIVE QUALITY MANAGEMENT SYSTEM. Over a comparatively short period of time, we have gained immense credibility and trust of the clients based worldwide. Our consistent approach towards delivering optimum functionality based Mill Products and Finished & Engineered Products has helped us to establish our prominence in the domain and cater to diverse industries. Our abilities to provide customized products and offer in bulk quantities, have allowed us to satisfy the clients to the fullest. Also, the customers can avail paid samples from us for assessment before placing orders. The competitive prices as well as customer centric policies of ours ensure provision of maximum benefits to the clients. 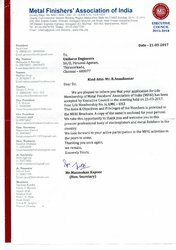 To keep abreast with advanced technologies / developments in our core competency area, in order to adopt them in our speciality manufacturing process for providing superior Quality & value added services to our customers.